“Into Darkness,” the sequel to JJ Abram’s 2009 re-imagining of the Star Trek franchise, debuted its first official poster today. 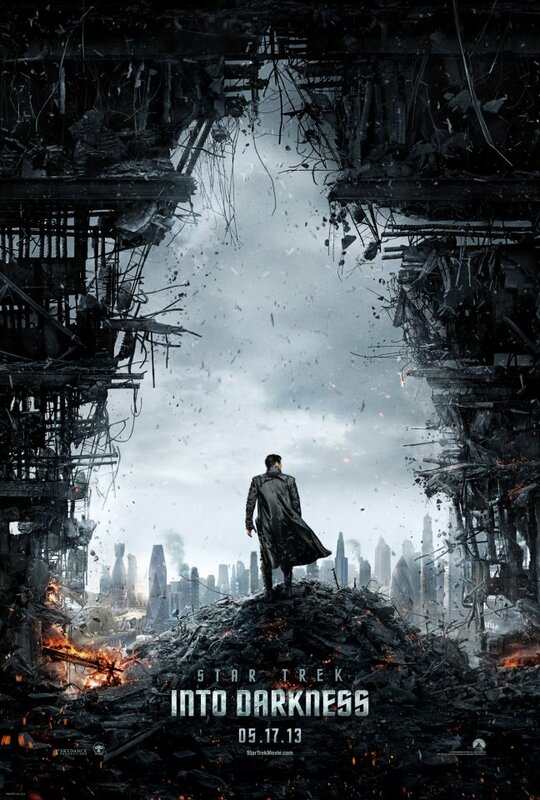 The cryptic art for the film features a charred city’s ruins that outline (in the shape of the Starfleet emblem) a lonely figure turned away from us. The iconic core characters are conspicuously absent, though the mystery man does appear to be wearing a familiar leather jacket from “The Matrix ” movies. The image is dramatic and faintly reminiscent of the famous Caspar David Friedrich painting, “Wanderer Above the Sea of Fog,” and also one of the teaser posters for “Dark Knight Rises,” which is perhaps an indication that the franchise will be taking a more somber tone for this second outing. If you look closely, you can see it’s actor Benedict Cumberbatch, who was cast as the film’s villain, though the identity of that villain was kept shrouded in mystery by Abrams and co. There’s been speculation since this sequel was greenlit that the villain in question was Khan Noonien Singh, the character originated by Ricardo Montalban in 1982 Star Trek classic, “The Wrath of Khan.” For many fans of the original franchise, “Khan” is the creme de la creme, with compelling performances from Montalban in the title role, extra theatrics from the eternally entertaining William Shatner’s Kirk, and a dramatic final scene for Leonard Nimoy’s Spock. If indeed we are looking at the rebirth of Khan, then expectations from fans will be astronomically high. The good news is, Khan or no, Benedict Cumberbatch (tremendous on the BBC’s updated Sherlock Holmes series) will indubitably give us a villain to be reckoned with. My money’s on Khan, though–who doesn’t want to see Chris Pine shake his handsome fist to the sky and bellow the name Khan to the heavens? Comments for First Official Poster for Star Trek Into Darkness are now closed.